Plastic scintillators belong to organic scintillators, but not organic crystal scintillators. It can be used for the detection of alpha, beta, gamma, fast neutrons, protons, cosmic rays and fission fragments. It is easy to transparent body into very large, easy processing into various shapes, with no deliquescence, stable performance, radiation resistance, short decay time and flashing advantages of low price, is a kind of scintillator is widely used today. A, simple in production, low in price, easy to process into various shapes, such as column, piece, ring, rectangle, well shape, tube, film, filaments, particles and so on. B, high transparency, good light transmission performance, can be made into large volume scintillator. C, scintillation attenuation time is short, suitable for nanosecond time measurement and high intensity radiation measurement. D, stable performance, high mechanical strength, vibration resistance, impact resistance, moisture resistance, no need for encapsulation, light saving 8~10a luminescence efficiency has no obvious change. E, radiation resistance in various scintillator first, can be used for high radiation field emission, high exposure rate. F, softening temperature is low, can not be used under high temperature conditions. G, soluble in aromatic ketones and solvent, ethanol, dilute acid, dilute alkali and very little impact on it. 1. Flowtubes, Monoblocks and Specular Reflectors for Lamp- and Diode-based Pump Chambers. – Blocking lateral stimulated emission, which can depopulate the laser rod and significantly reduce amount of the extracted energy in Q-switched mode. For the Q-switched Nd:YAG Laser Samarium-doped Glass is the material of choice, because it attenuates lateral depumping effects, thus avoiding super luminescence phenomena and absorbing undesired UV radiation. Cerium Glass and Europium Quartz Glass are also interesting doping materials, because they absorb undesired UV-radiation and can additionally re-emit this energy in the useful spectral range. For free-running lasers, Duran and Quartz Glass are the materials of choice for fabricating the flowtubes, while undoped-YAG and Sapphire can also be used when harsh conditions warrant. Flowtubes and monoblocks are machined out of a block of glass with highly polished interior and exterior surfaces. The channels containing the laser rod and flashlamps are deep-bored with tight control of dimensions and tolerances on parallelism and perpendicularity. In case of Sm- or Eu-doped glass, the monoblocks are subjected to ion-exchange strengthening in accordance with instructions of glass manufacturer. All shapes and configurations of monoblocks are available including multi-channel cylindrical, ellipsoid, shotgun, etc. sections with flat or indented end-surfaces for reliable sealing. Please contact us with your specific requirements. The monoblocks can be used as part of diffuse pump chambers with BaSO4 reflectors. In addition, the polished exterior cylindrical or elliptical surfaces can be coated with Cu/Ni-protected Silver or Gold coating to form the high efficiency Specular Reflector, with some standard configurations available on a short notice. Presence of strong thermo-optical effects in high power diode pumped lasers presents a challenge in obtaining high output power with low-order modes. In various Nd:YAG laser configurations like rod, slab or disk lasers thermally-induced refractive index changes lead to lensing, aberrations and birefringence. For power scaling of diode pumped solid state lasers the uniform pumping configuration and effective thermal management are required. For better pumping and cooling management of diode-pumped solid-state lasers, our preferred vendor has developed a range of state of the art Sapphire and Fused Silica reflector flowtubes for axial uniform pumping. The barrel surface of flowtubes is coated by Cu/Ni-protected, highly reflective Gold layer. For uniform distribution of laser diodes pumping radiation within laser rod, multiple configurations of flowtubes have been developed. Due to high manufacturing precision combined with innovative know-how, these reflectors demonstrated reduced thermally-induced effects of lensing and aberration, and improved output power and optical-to-optical efficiency of the laser. 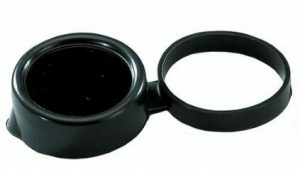 IR Lenses are used to collect, focus, or collimate light in the near-infrared, short-wave infrared, mid-wave infrared, or long-wave infrared spectra. IR Lenses are optical lenses that use specific substrates or anti-reflection coatings to maximize performance for applications operating above 700nm including thermal imaging, FLIR, or spectroscopy. The infrared spectrum refers to 700 – 16000nm wavelengths. When divided into smaller spectra, NIR refers to 700 – 900nm, SWIR is 900 – 2300nm, MWIR is 3000 – 5000nm, and LWIR includes 8000 – 12000nm wavelengths. Edmund Optics offers a large variety of IR Lenses including singlet lenses, achromatic lenses, aspheric lenses, or focusing objectives for high performance across a large portion of the infrared spectrum. IR Achromatic Lenses are ideal for use in a variety of industrial, life sciences, or defense applications including FTIR spectroscopy or for use with tunable QCL lasers. Zinc Selenide IR Aspheric Lenses feature diffraction limited designs that are ideal for focusing the output of CO2 lasers. Additional substrates include germanium, sapphire, silicon, zinc selenide, or zinc sulfide. Anti-reflection coating options include VIS-NIR, NIR I, NIR II, Telecom-NIR, or SWIR.